Kart Racing comes to Louisiana! Experience the thrill of racing just inches off the ground at the largest karting track in the US. We offer karting options for everyone from our daily rentals and rental leagues to race series for those that own a racing kart or purchase one from our in-house kart shop. NOLA Motorsports Park is proud to call New Orleans home and because of this our track is less stuffy and just plain fun. No other race track in America is as close to such a wonderful place as we are - just a short 20 minute drive from the historic French Quarter area. 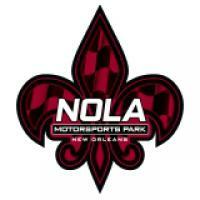 NOLA Motorsports Park is a full-featured events facility located in New Orleans, Louisiana. Our facility, designed by Alan Wilson, is capable of hosting events for both large and small groups. Just minutes outside of the historic New Orleans French Quarter, we are convenient to the entire metro area. We offer programs for the general public in the form of high performance driving schools, track days, kart rentals, driver education courses, spectator events, ridealongs with professional drivers and much more. Our facilities have many meeting rooms for groups as small as ten to groups of thousands.